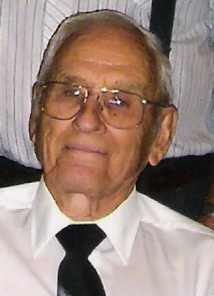 Gordon Leroy Speicher, 93, of Loveland, Colorado, died on July 11, 2011 at North Shore Health and Rehab in Loveland. He was born on March 17, 1918 in Wray, Colorado, to Jesse Clay and Mary Viola (Saville) Speicher. He married Rosie Opal Owens on August 20, 1939 in Holyoke, Colorado. She preceded him in death on December 10, 1988. Gordon later married Catherine Louise (Griffin) Ingram on March 17, 1990 in Longmont, Colorado. She preceded him in death on June 12, 2011. Gordon owned and farmed a large acreage in Eastern Colorado until 1953, before moving to Loveland. He continued to farm and operate his own dairy farm until 1964. He later worked as a carpenter and then as a machinist for Dual Matic in Longmont. Gordon continued to work at various jobs up until his final retirement in 2007. He was a lifelong member of Church of the Nazarene. Gordon loved motorcycles and finally sold his last scooter just a few years ago. He enjoyed camping, building things and tinkering in his shop. Gordon is survived by his children, Dennis Speicher and wife Marje of Gill, Colo., Nadine Hooley of Loveland, Donna Lohnes and husband Calvin of Johnstown, Colo., DeVere Speicher and wife Nancy of Loveland, brother, Lloyd Speicher of North Platte, Neb., sisters, Irma Sloniker of Wray, Colo., and Esther Winters of Hoquiam, Wash. He is also survived by 8 grandchildren, 15 great-grandchildren, and 15 great-great-grandchildren. He is also preceded in death by two brothers, one granddaughter and 4 great-grandchildren. Funeral services will take place at 10:30 a.m., Saturday, July 16, 2011 at Loveland Church of the Nazarene. Visitation will be from 2-4:00 p.m., Friday at Kibbey Fishburn Funeral Home in Loveland and at the church prior to the service. Interment will be held at 10:00 a.m., Monday July 18, 2011 at Mountain View Cemetery in Longmont. Memorial contributions may be made to North Shore Rehab in care of Kibbey Fishburn Funeral Home, 1102 N. Lincoln Avenue, Loveland, CO 80537. Next Story: Isn’t Medicaid cut a tax hike?